The last couple of years has seen rapid proliferation of mesh networking kits / whole-home Wi-Fi systems in the market. Recent market research suggests that the mesh network segment is almost up to a quarter of the whole Wi-Fi router market. Almost all of the Wi-Fi system kits currently in the market (such as the Netgear Orbi, TP-Link Deco, D-Link Covr, Luma, eero etc.) are based on Qualcomm silicon. Notable exceptions are the Securifi Almond 3, Amped Wireless Ally, and the Ubiquiti Networks AmplifiHD. As part of the 2017 Computex announcements, Qualcomm is taking the lead in formalizing the roadmap for mesh routers. Most of the mesh networking features are based on Qualcomm's Wi-Fi SON (self-organizing networks) set of firmware features. Qualcomm is terming the current set of features as 'Mesh Networking 1.0'. Today's announcement is a reference design (the Qualcomm Mesh Networking Platform) which includes / improves these existing features, and also adds some IoT functionality. IoT connectivity feature suite - A 802.15.4 (ZigBee) radio, as well as Bluetooth (with the CSRmesh functionality), has been added to enable the new systems to interact directly with smart home devices (without the need for an IP bridge in the middle). 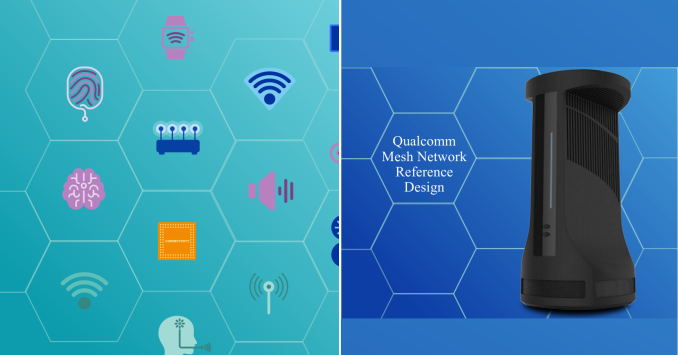 Since ZigBee and Bluetooth also operate in the 2.4 GHz band, Qualcomm has added interference mitigation to the board design so that the ZigBee and Bluetooth connectivity don't impact the performance of the Wi-Fi sub-system. Voice assistant capabilities - The popularity of voice assistants such as Amazon Alexa, Google Home, etc. has resulted in multiple Wi-Fi devices in the home whose sole functionality is to listen and respond to voice commands. These devices end up impacting the overall Wi-Fi performance in the home for very limited functionality. This use-case is perfect for integration into the units of a mesh Wi-Fi system. Qualcomm is integrating support for APIs to various popular cloud-based assistant applications into their reference design. Carrier-grade features - New firmware features enable easy cloud-based management capabilities. In addition, Qualcomm is also exposing certain APIs to customers that will enable porting of SON features into routers / extenders based on silicon from other vendors. Additional backhaul capabilities - Current generation mesh networking kits include a wide variety of backhaul options including Wi-Fi, wired Ethernet, and PLC (powerline communication). Qualcomm is also advertising 802.11ad, as well as 802.11ax support for backhaul purposes. A major chunk of the new functionality (IoT functionality and voice assistant capabilities) already exist today in the Securifi Almond 3. Securifi is one of the pioneers in integrating smart home / IoT functionality into a Wi-Fi router. The Almond 3 is based on a Mediatek platform, and the company has put in extended effort to ensure that the IoT functionality is integrated well with the router functionality from the user-experience perspective. Qualcomm's integration of these features into a reference design will enable more vendors to bring such systems into the market without expending a lot of effort.